pankajgh3 5 months, 3 weeks ago. 1. All pages have black backgrounds, except the header; it is white. On my computer I have white backgrounds of all the pages and outside the pages, I have a repeated image, which does not show up on my tablet either. 2. My Menus show up OK; however, my sub-menus don’t stay up long enough to select them. Can you help me with those few problems? Please notify me via e-mail ([email protected]) when you have an answer. 1) We’ll probably need to see a link. 2) Again, it might help if we actually can view it to see what is actually going on, but the Sub-Header Menu will not display on smaller screens. 3) Sorry, I’m not sure what you are referring to here. Can you explain a bit more? 1. The link to my website is http:// 05c.7a0.myftpupload [dot] com/. 2. I developed it on my computer and then I tried to see it on my RT Tablet. The sub-headers actually display, just a flash, but don’t stay up long enough to select anything. I have not even tried on my smartphone. No use, if it doesn’t work on my tablet. 3. I have links to *.pdf documents to be displayed in a new window. They do show up; however, I don’t see the tabs so I can get rid of the new window, thus get back to the main page. 2. The sub-headers do show up for just a flash, not long enough to select anything. 3. I have links to *.pdf documents to display in a new window. That works; however, I don’t see how I can get rid of the *.pdf file to get back to the main page (no tabs to click on). If you try the website, the one on the tablet does not have the same “page background” nor the same “outside background” as the one on my computer? I have only tried the website on my RT Tablet. Once that works properly, I will try it on my smart phone. How do I reply to you, Thomas? I have now typed my response twice & pressed submit, but I do not see my reply? You’re last three replies where marked as spam by Akismet because of the URL you used. I had to break it up. 2) I’m not seeing the Sub-Header menu being used, sorry. But everything looks fine there. Or maybe I’m looking at the wrong thing. If you can provide screenshots of what you’re seeing that would help greatly. You can use a free service like imgur.com and paste the URL(s) in a reply. 4) Also, sorry, but I’m not sure what you mean by RT Tablet. Is that a Microsoft Surface or an Apple product? Some Apple products (their browsers) don’t work well with fixed backgrounds. You have to set them to scroll, but that may affect their appearance on other devices. This is the website I developed on my Windows 7 desktop: http://05c.7a0.myftpupload.com/. You can see the sub-menus on Photos for example. 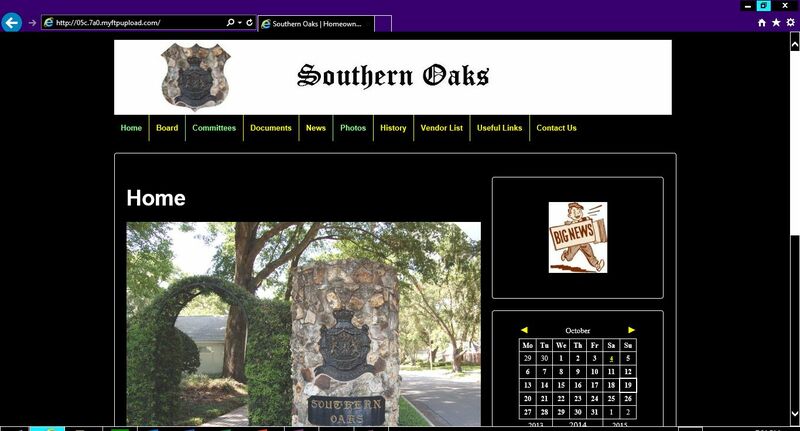 When I bring up the same http://05c.7a0.myftpupload.com/ on my Microsoft RT Tablet it looks like this: http://05c.7a0.myftpupload.com/wp-content/uploads/2014/10/Southern-Oaks-Website-on-Microsoft-RT-Tablet.jpg. The menus are all there; however, when you select Photos like before, I sometimes see a flash of the sub-menus, but can’t select anything? The link to a *.pdf file come up if you click on the Paper Boy on the right Sidebar. It is supposed to come up in a new window and it may, but I can’t get rid of the window (another tab in Windows 7). Any ideas? I have not tried it on a smartphone yet. I replied to you, but probably went into the Spam Bucket again? I just tested your site in the latest version of IE11 and I do not have any problem with your site. It seems like everything is working fine, including the PDF. Once the PDF opens in the new tab, I can close it with no problem. Do you know which version of IE the tablet is using? I didn’t understand your query properly, can you please elaborate more maybe with the screenshot, if possible? Moreover, please share your site URL and let me know the version of the theme you are using? This will help me to check the issue and assist you better. I am experiencing similar issues on our website as of the last update. Problem: Menus on mobile devices do not stay open long enough to tab a submenu item. Platforms testes: Trouble is ONLY ON MOBILE. I have tested on Android (5, 6 and 7). I have not tested on iOS devices. Desktop versions work fine in every browser. To duplicate problem, navigate to the website. Press on courses or locations (both have submenus) and then try to press on any of the submenus. You will find that you cannot navigate to any of the submenus using the menu system. Menu location used: header Menu. Problem seems to mitigate if using the sub-menu location, but the same menu when place in that location expands to much to use on the site. I checked your site and yes, there exists an issue. Can you please let me know the version of the theme you are using? Also, please check if there exist plugin conflict due to which you are facing this issue? Try deactivating all the plugin and check if you are still facing the issue. Try loading the site in private window or in incognito mode. Try it and let me know the result.